More recently, developers have released an update where it became possible to change the standard sounds. Thanks to this, addonmakers can now create even more unique and colorful modifications for Minecraft PE. 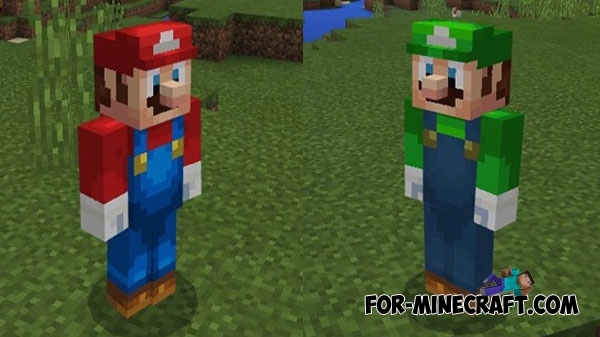 Mario Craft Addon is one of the first where new mobs got the original sounds that will please any player. The addon adds 4 new creatures from the Super Mario game at the moment, but the creator will necessarily expand the list of characters and items possibly. By installing the addon you will meet the main characters in the ordinary world without using spawn eggs. But for this you will have to run a lot, especially to look for villages. New mobs have funny sounds of attack, spawn, walking and interaction. In total there are more than 30 different sounds. All creatures are neutral except Bob-omb, which has the same abilities as a creeper. The rest of the mobs are of course Mario, Luigi and Toad are neutral and can be tamed. Have you guessed what you need to use for taming? As it is not strange, you need mushrooms, they can make Mario and Luigi become your friends.